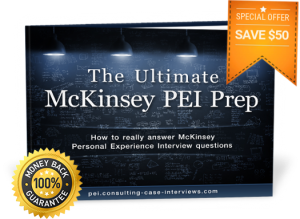 How long does the McKinsey PEI (Personal Experience Interview) take? For most candidates, the McKinsey PEI lasts in total around 12-15 minutes. It follows some social chit-chat in the very beginning of your interview session and some more general CV-related questions your interviewers might have, and will be before your case interview. While talking about one specific example for 10+ minutes might seem long at the outset, you will be surprised how quickly this amount of time will pass – and finally how much work you need to put into your PEI examples to deliver all the relevant information in the necessary details as required into this few minutes of PEI time. In rare cases the PEI lasts up to roughly 20 minutes – mainly driven by your McKinsey interviewers interests in your PEI example or your (maybe not-so-good) PEI performance which makes it very hard for the interviewer to discover the relevant aspects of your PEI. Since your final-round interviews focus strongly on those areas in which you could not fully convince all your McKinsey interviewers in the previous rounds, you might not have any PEI in your final interview rounds at all, or you might even have a very intense foucs on the PEI. Previous Previous post: Can I use the same PEI example in different McKinsey Personal Experience Interviews? Next Next post: How recent should my McKinsey PEI examples be?